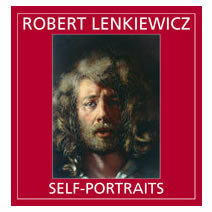 Robert Lenkiewicz: Self-Portraits formed the catalogue to the exhibition Robert Lenkiewicz: Self-Portraits 1956-2002 at the Ben Uri Gallery, The London Jewish Museum of Art in 2008. The 38 self-portraits collected in this book span the artist’s whole career. From his first paintings as an earnest fifteen-year-old boy, working in Room No. 3 of the Hotel Shemtov, the Jewish hotel run by his parents in Cricklewood in the post-war years, to the haunting last self-portrait in hospital shortly before his death in Plymouth aged sixty, these images make for an encyclopaedia of the artist’s changing styles and philosophical interests down the years. Lenkiewicz famously chose the outsider as the subject for his art: the vagrants and street alcoholics who dossed at his studios, families with mentally handicapped children, the elderly, the dying — human beings isolated from one another by their circumstances and from themselves by their preoccupations. ‘You’re born alone and you die alone,’ he said and the problem was to deal with the isolation of simply being alive. Lenkiewicz found one solution – a richly creative life conducted with panache – and left behind a legacy which will appeal to anyone with an interest in the conundrum of existence. ‘Skill is a faculty that is half-asleep,’ said Lenkiewicz, yet his self-portraits transcend mere technique and confront the spectator with the fully alert and unflinching gaze of an artist profoundly interested in ‘the business of living’. 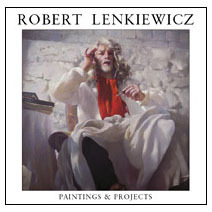 Robert Lenkiewicz: Paintings & Projects is a stunning new monograph which provides a definitive overview of Robert Lenkiewicz's unique life and artistic career. The text surveys the reasoning behind the artist's method of painting large-scale 'Projects' on themes such as Vagrancy, Jealousy, Self-Portrait, Old Age, and Death. The ideas underpinning the artist's thinking about the nature of human relationships are fully explored. 80 colour plates, many showing paintings never before published, show the full breadth and development of his extraordinary range and skill as a painter. The book also features the colour photography of Derek Harris, which captures the dramatic surroundings of the artist's studio and private library. A specially bound Collector's Edition, including a limited edition print of a portrait by photographer Derek Harris, is also available. 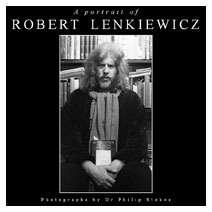 A Portrait of Robert Lenkiewicz: Photographs by Dr Philip Stokes is a pictorial biography featuring more than 400 photographs from 'The Lenkiewicz Archive' by Dr Philip Stokes. Between 1968–2002, renowned photographer Philip Stokes compiled a unique archive of images and biographical material about his close friend, the painter Robert Lenkiewicz. Dr Stokes' remarkable photographs offer a tantalizing glimpse into the life of Robert Lenkiewicz in a striking visual style which ideally complements the painter's own work. Dr Stokes recorded landmark public events in the artist's life as well as working practices in Lenkiewicz's studios with sitters for many of his most significant paintings. He was also granted unique access behind the scenes, capturing the artist in intimate private settings. The archive also includes a visual record of the development of the artist's magnificent private library. This large-format hardback book contains 180 pages and reproduces many images in full 11 x 8 ins size. A large-format A3 (420 x 300 mm) round-backed hand sewn facsimile of the elephant folio illustrated notebook containing 130 pages. 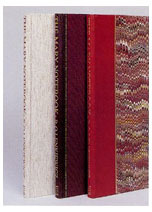 Published in 1998 as a limited edition of 350 copies, The Mary Notebook standard edition was produced in two luxury bindings: Belgian Hessian (at left) and red linen with bonded leather spine and gold lettering (centre). A small number of artist's proofs were also bound in distinctive Moroccan leather quarter bindings in navy, black or crimson with marbled paper boards (right). The binding was carried out by The Elephant Press at Port Eliot, Cornwall, to reflect Robert Lenkiewicz's love of fine book bindings. Each Notebook has a matching slipcase and comes with a Certificate of Authenticity signed by the artist. The Notebook's are accompanied by a signed print called 'Study of Mary'. A few copies of the red linen standard edition (centre) are still available. 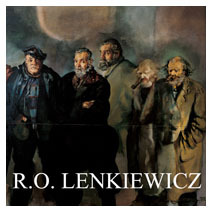 R. O. Lenkiewicz is an art biography on the life and work of artist Robert Lenkiewicz published by White Lane Press in 1997. Now out of print, though copies may sometimes be found at Lenkiewicz-related auctions, or the thriving Lenkiewicz memorabilia market on e-Bay. Selected chapters from this publication are available on the discussion forum dedicated to the artist – lenkiewicz.org.Originally published to coincide with a major Retrospective of the artist's work in 1997 at Plymouth City Museum & Art Gallery, this volume has been superseded by the publication Robert Lenkiewicz: Paintings & Projects, published in October 2006.